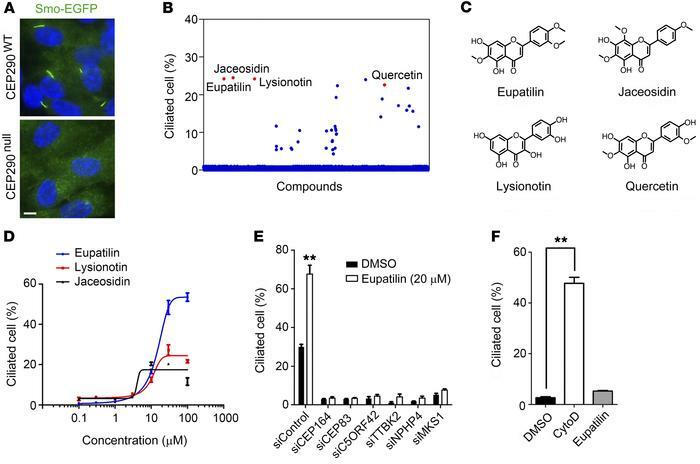 Identification of compounds that rescue ciliogenesis defects caused by CEP290 knockout. (A) Defects in serum starvation–induced ciliogenesis in Smo-EGFP+ CEP290null RPE1 cells. Scale bar indicates 5 μm. Nuclei were marked with DAPI (blue). (B) Screening of chemical compounds that promote cilium assembly in Smo-EGFP+ CEP290null RPE1 cells. (C) Structures of plant flavonoids identified as screen hits. (D) Flavonoid dose-response curves of Smo-EGFP+ CEP290null RPE1 cells. (E) Effect of eupatilin on serum starvation–induced ciliogenesis in CEP290WT RPE1 cells transfected with the indicated siRNAs. (F) Effect of cytoD and eupatilin on ciliogenesis in CEP290WT RPE1 cells cultured in the presence of 10% serum. Error bars represent SEM (n = 3 independent experiments; **P < 0.01, t test).